Here is the first plan I wrote, out of necessity! 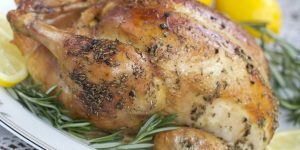 I couldn’t figure out how to deal with so many different parts of the chickens I was doing unless I had everything written down and the recipes gathered together… My Strategy – When dealing with meats that have different parts, you need to think about how you will use each to get the maximum amount of food for your dollar. 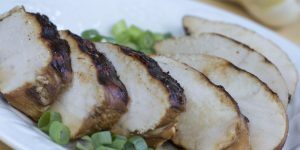 Here is how I handled chicken (the same approach can be used for turkey and many of these recipes will work for turkey). Here is my “Hamburger Plan”, probably one of my most used so far. 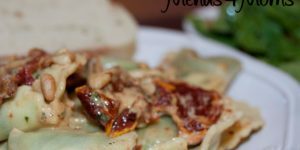 I love having all of my favorite recipes in one place, and I find myself referring back to it often… Here are many ideas pertaining to hamburger, “master recipes” are on the left, “secondary recipes” are indented – you assemble these from the master recipes. You can also freeze the portion of the master recipe that is required in the secondary recipe and assemble the secondary recipe on the day you want to eat it. I do this a lot when trying and/or learning new recipes. If you keep browned ground beef and sautéed onions and peppers in your freezer, this is a quick Italian meal to make for nights when you have little time to prepare dinner. It is delicious served with a salad and garlic bread. That turkey carcass leftover from your holiday meal is treasure, not trash! The frame from your turkey (or chicken) makes the most delicious broth you have ever tasted. Simply put the bones (and skin if you have any) into your slow cooker and cover it with water. Let it simmer overnight and in the morning you will have the base for a delicious soup. This recipe is inspired by David Lebovitz’ Roast Chicken with Caramelized Shallots. 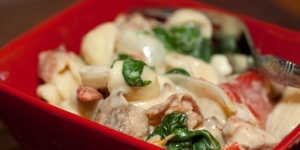 With just a few ingredients and little preparation, it is simple yet delicious. I chose skinless, boneless breasts to keep the dish low fat but you may use any kind of chicken you wish. 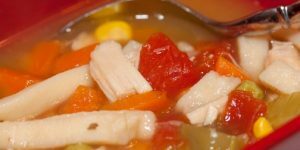 It is starting to cool off with pleasant days and chilly nights – the perfect time for hearty soups and stews. 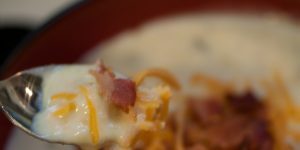 Baked Potato Soup is one of our most requested recipes – it’s creamy and rich with the perfect balance of flavors. It’s a good way to use planned leftovers as well; have baked potatoes during the week and simmer a pot of this satisfying soup on the weekend. Start with 4 large baked potatoes, cooled. The recipe calls for scooping out the insides and discarding the peels, but I have long since abandoned peeling potatoes for anything. The peels are healthy so I include them in mashed potatoes, soups, potato salads, and just about everything else. Feel free to use only the white insides if you wish. 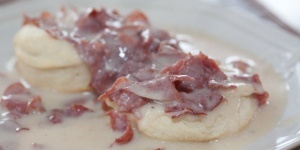 We love to have breakfast for dinner at our house, and one of our favorites is biscuits and gravy. You can make this gravy with either sausage or dried beef, and it can be served over buttermilk biscuits, toast, or soft rolls.